You have been called to the Emergency Department to see a 4 month old boy who presented to the Emergency Department with his parents. He has not been himself since yesterday afternoon and been making ‘funny movements’. On arrival to the ED he was unconscious and was having a generalised tonic clonic movements of all 4 limbs. 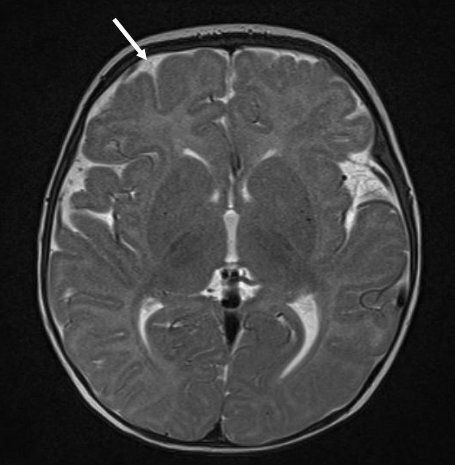 What is your differential diagnosis of the cause of his seizure? History – He was perfectly well prior to yesterday where he abruptly seemed unwell and had a large vomit, then looked better. Seen by ambulance who felt that he had transiently choked and now looked well. After this episode his is not his usual self, started having unusual movements frequently overnight. Parents presented to hospital this morning when abnormal movements continued. No history of fever. No history of being unwell or unwell contacts. No history trauma. On examination: 10kg infant, pale. Afebrile. No rash or bruises. HR 150 bpm (upper limit of normal for age), BP 100/50 (normal for age). Oxygen saturation 94% room air. Having generalised tonic clonic seizure. Fontanelle normal. HS dual, chest clear, abdomen soft no masses. How would you immediately manage the patient? What would you do to confirm the diagnosis? In addition to the SDH, what do these MRI’s show? This infant went on to survive extubation. He was eventually discharged into supported care with the developmental status of a newborn. 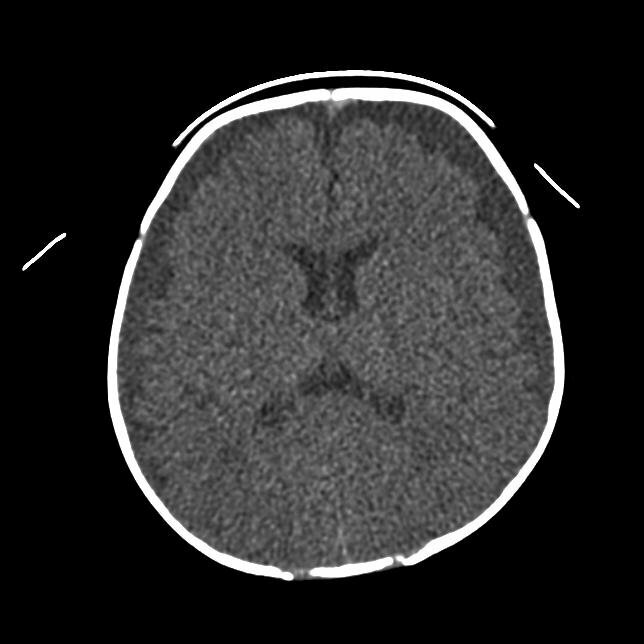 Two months later he had a routine CT head at an outpatient appointment. He was clincally well, and slowly making developmental progress. His head had not grown at all in the intervening 2 months, and had gone from the 95th to the 75th percentile. His CT images are below. What is the most accurate description of these images? What is the likely mechanism? Remember with infants it is often easier to get blood work done when you are inserting the IV cannula. If the infant is hypoglycaemic, also consider a metabolic workup. CT head is important to rule out a mass lesion or evidence of trauma once adequate airway secured. This child has an anaemia but no coagulopathy or evidence of abnormal white cell count. 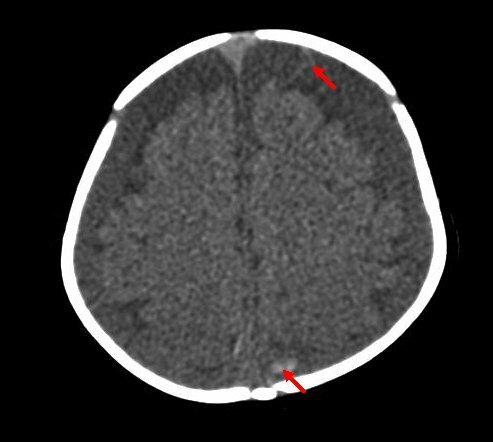 The CT shows large bilateral subdural effusions with evidence of a small amount of fresh haematoma on the more cephalad slice posteriorly (red arrow). Infants have more generous subarachnoid CSF spaces than older children and adults. 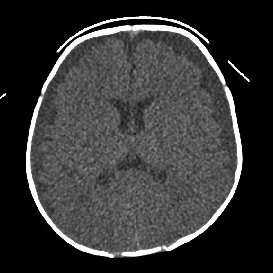 The combination of high and low attenuation fluid suggests acute on chronic subdural collections, however remember that hyperacute non clotted blood can also appear isodense to brain on CT. This picture most frequently represents a child who has had repeated episodes of head trauma. In the absence of a history of trauma, this is most likely to be inflicted head trauma. 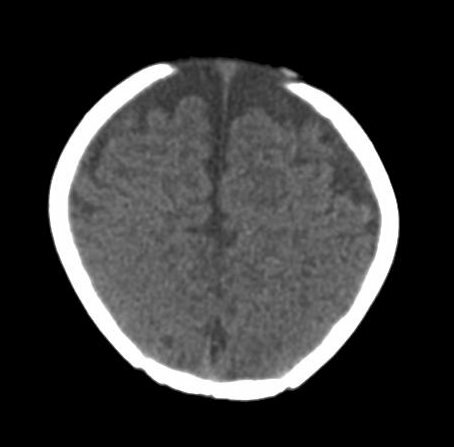 A subdural empyema/hydrocephalus would not contain high attenuation areas. A child with chronic hydrocephalus would usually have markely splayed sutures as the hydrocephalus tends to develop slowly. The triad of subdural haematomas with retinal haemorrhages and encephalopathy in the absence of a history of significant trauma, while no longer considered pathognomonic, is highly suspicious for non accidental injury, frequently caused by shaking or impact to the head. Fundoscopy should be arranged as soon as the diagnosis is suspected and the child is sufficiently stable. A skeletal survey (xrays of all the bones in the body) is performed to exclude other acute and healing fractures (assessing for multiple episodes of injury). It is performed when the child is sufficiently stable. If no history of trauma is forthcoming when the history is taken, it is unwise to continue questioning the parents about what happened. While an EEG may localise a seizure focus, this will not specifically help make a diagnosis of non accidental injury. 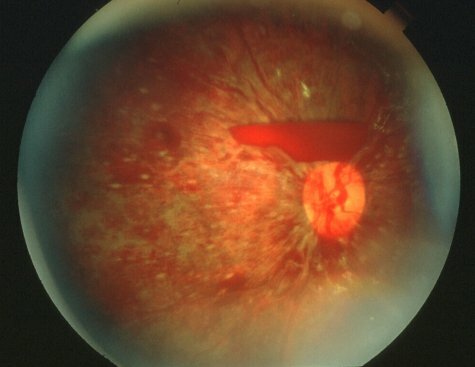 This child’s fundoscopy showing severe bilateral retinal haemorrhages in all layers of the retina. The infant brain contains more water and less myelin than the adult brain, modifying the MR image. T2 weighted image – Bright bilateral subdural collection anteriorly indicating old blood (green arrows), with fluid-fluid level posteriorly on the left subdural collection (red arrow) indicating higher density product settling with gravity (pus, blood). 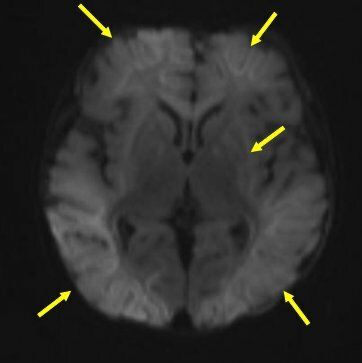 T2 hyperintensity, loss of grey-white differentiation and swelling of frontal, parietal and occiptal cortex and white matter indicating acute injury (yellow arrows). 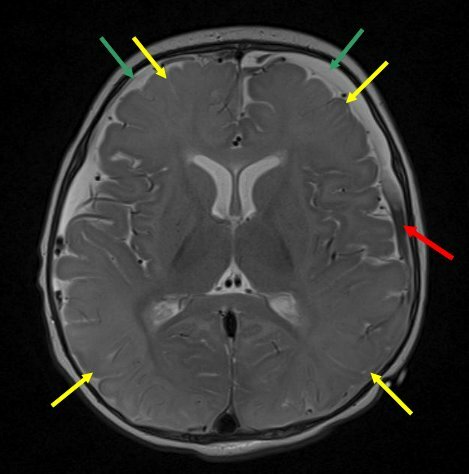 T2 weighted image – Subdural space not clearly visible, with fine subarachnoid space (white arrow). No collections or gradation of colour within the subarachnoid space. 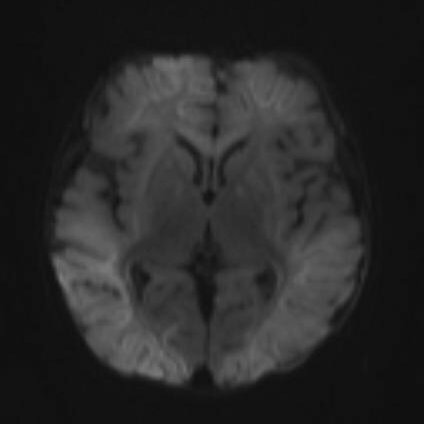 Good grey-white differentiation in cortex. Infants have less myelin than adults rendering their white matter more T2 bright than adults. 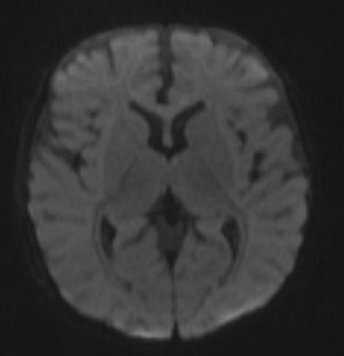 DWI – Evenly grey image showing no restricted diffusion. 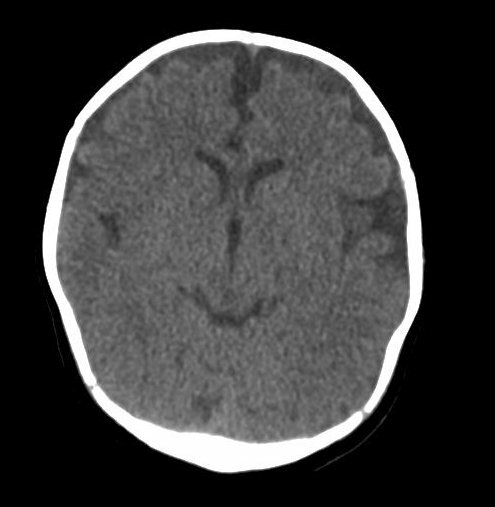 This CT shows cerebral atrophy with large subdural collections of varying radiodensity. There is evidence of acute subdural bleeding on the left (whiter collection in subdural space – red arrows). 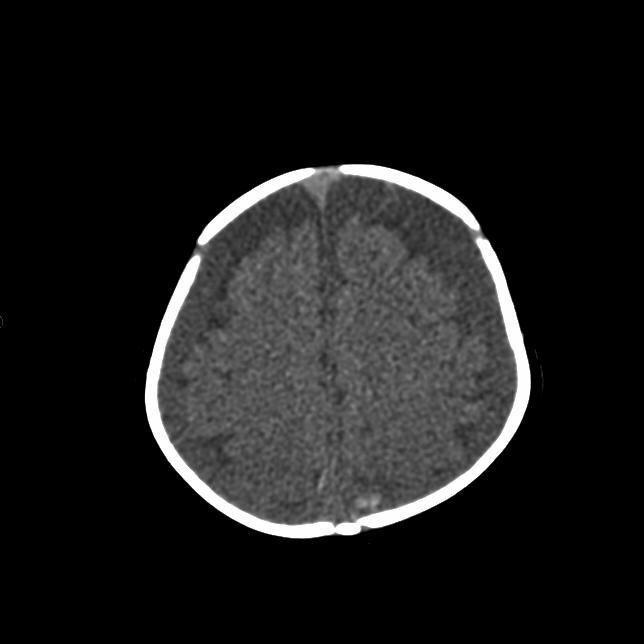 Rebleeding into existing subdural haematomas are well described, especially in children with enlarged subarachnoid spaces due to cerebral atropy. Due to the risk of repeated non accidental injury, the infant had a repeated ophthalmological assessment and skeletal survey which did not show any evidence of new injury. The collection required draining due to a gradual increase in size. There was no evidence of raised ICP. The basal cisterns were patent, and fontanelle soft. The infant remained clinically stable. 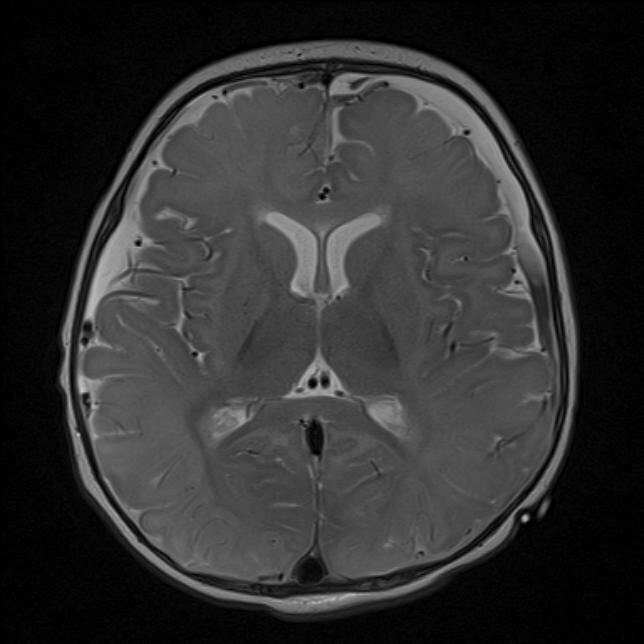 This child is expected to have a very severe neurological deficit, however is likely to survive long term.